10 april 2019 - Today, the prestigious journal Nature publishes two papers describing the first results of the Belgian NOMAD instrument on board ExoMars Trace Gas Orbiter. New evidence of the impact of the recent planet-encompassing dust storm on water in the atmosphere, including the first vertical measurements of semiheavy water on Mars, and a surprising lack of methane, are among the scientific highlights of the ExoMars Trace Gas Orbiter’s first year in orbit. Principal Investigator of the NOMAD instrument, Ann Carine Vandaele at the Royal Belgian Institute for Space Aeronomy is delighted with these results. 6 april 2018 - On Friday, April 13, 2018, the Danish ASIM experiment will be installed on the outside of the European Columbus module of the ISS International Space Station. The instrument must give us insight into the luminous phenomena that take place over violent thunderstorms. The Belgian B.USOC is responsible for the infrastructure and operations of ASIM. 21 March 2018 - Two years after its launch, ExoMars Trace Gas Orbiter (TGO) finally settles in its final orbit around Mars. The satellite, which carries the instrument NOMAD of the Royal Belgian Institute for Space Aeronomy (BIRA-IASB) on board, has just completed one year of atmospheric deceleration and is now circling around Mars every 2 hours, some 400 km above the Martian surface. The Belgian instrument NOMAD, which will search for methane and other important gases in the Martian atmosphere, appears to have passed this period very well and is ready to start its scientific phase within a few weeks. The role of solar variability on climate change remains a topic of strong scientific and societal interest. An international scientific team, with an important role for the Royal Belgian Institute for Space Aeronomy (BIRA-IASB), has accurately determined a new solar reference spectrum from measurements made by the SOLAR/SOLSPEC instrument on board the International Space Station. The study behind this story was published in the journal Astronomy and Astrophysics in November 2017. 8 December 2017 - A recent paper in Reviews of Geophysics explored the challenges of validating data collected from Earth observation satellites. The wealth of information about our planet generated by satellites circulating the Earth is remarkable, informative and powerful, but not without its challenges. An article recently published in Reviews in Geophysics, highlighted the inherent uncertainties of satellite data and discussed different methods for validation. The editor asked the authors to explain what validation means, why it is necessary, why it is so complicated, and what could be improved. Sentinel-5p first light: first TROPOMI results. 4 December 2017 - Launched on 13 October, the Sentinel-5P satellite has delivered its first images of air pollution. Even though the satellite is still being prepared for service, these first results have been hailed as exceptional and show how this latest Copernicus satellite is set to take the task of monitoring air quality into a new era. The Sentinel-5P imaged sulphur dioxide from the Mount Agung volcanic eruption on Bali, Indonesia, on 27 November 2017. During an ESA press event, organised at the German Aerospace Center (DLR), a range of images and animations were shown, demonstrating the unprecedented spatial resolution delivered by the TROPOMI sensor. 11 October 2017 - On October 13, 2017, the European satellite Sentinel-5 Precursor (Sentinel-5p) will be launched from the Russian Cosmodrome of Plesetsk on behalf of the European Space Agency (ESA). After the successful launch of several Sentinel satellites for the monitoring of lands and oceans, Sentinel-5p has been developed by ESA and the Dutch Space Agency (NSO) as the first atmospheric monitoring satellite of the EU Copernicus Earth Observation programme. The latter aims at the operational provision of advanced information services on our environment and security to public authorities, policy makers and the citizen. As part of this programme, Sentinel-5p having on-board the TROPOMI instrument will be the precursor of the future Sentinel-5 mission to be launched in 2022. 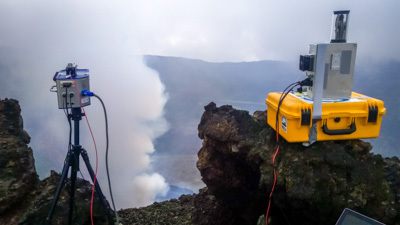 In June 2017, the UV-Vis DOAS group participated in a 12 day scientific measurement campaign in and around the main crater of the Nyiragongo volcano (in the Democratic Republic of Congo) as part of a BBC documentary expedition. The aim of the campaign was to collect scientific data with different types of instruments (seismic, infrasound detectors, temperature data loggers, weather stations, and several types of cameras) in order to better understand the physical mechanisms that drive volcanic processes in the region. 23 May 2017 - Researchers investigated the role of gases emitted by plants on atmosphere and climate in the Amazonian rainforest, the world’s most important ecosystem. Among these gases, isoprene plays a key role in atmospheric chemistry. For the first time, the fluxes of isoprene were directly measured from aircraft in central Amazonia. The researchers discovered a surprising link between the fluxes and surface elevation in the forest. A team from the Royal Belgian Institute for Space Aeronomy (BIRA-IASB) compared the observations with atmospheric models, which are constrained by satellite observations, and found similar results. 4 May 2017 - ALTIUS (Atmospheric Limb Tracker for Investigation of the Upcoming Stratosphere) is a satellite mission proposed by the Royal Belgian Institute for Space Aeronomy, aiming at the remote sensing of key atmospheric constituents at high vertical resolution. ALTIUS will be part of the Proba family. This platform has demonstrated excellent attitude control and agility with previous missions such as PROBA-1, PROBA-2, and PROBA-Vegetation. They help monitoring the impacts of political decisions to protect our environment. This is also crucial for the modeling community pushing for a better inclusion of the stratospheric composition both for improving short-term (weather) and long-term (climate) numerical predictions. As an element of answer, ALTIUS (Atmospheric Limb Tracker for Investigation of the Upcoming Stratosphere) aims at building on the great success of previous limb-scatter and occultation instruments to provide globally distributed key atmospheric species concentration profiles. The ALTIUS mission concept has been studied since 2006 by the Royal Belgian Institute for Space Aeronomy (BIRA-IASB), together with OIP Sensor Systems and Qinetiq Space Belgium. ALTIUS is an element of the ESA's Earth Watch program. 15 Februar 2017 - The ground control in Belgium switched off a package that had been continuously watching the Sun from the International Space Station for nine years. ‘Solar’ has been measuring most of the radiation emitted by our closest star across the electromagnetic spectrum. 14 December 2016 - Aviation is one of the most critical infrastructures of our times. Even comparably short interruptions in commercial aircraft operations can cause economic damages in the billion-dollar range. Natural or manmade airborne hazards such as volcanic ash clouds and nuclear releases may crucially effect the operations of the worldwide aviation system. The Eyjafjallajökull eruptions in Iceland 2010 showed the vulnerability of such a complex system, with thousands of passengers stranded and stakeholders as well as decision makers unprepared to cope with such an event. Safe flight operations, air traffic management and air traffic control are a shared responsibility of EUROCONTROL, national authorities, airlines and pilots. Despite experiences as in 2010 there is still a gap between available data and information and the stakeholders’ needs for high quality data in order to make consistent decisions. With the EUNADICS-AV (“European Natural Disaster Coordination and Information System for Aviation”) Project, the Consortium envisions to close this gap. 29 November 2016 – “I am thrilled to see the hard work of the NOMAD team successfully culminating in the first scientific data of the Martian atmosphere! This is the result of a tight international collaboration, lead and mainly financed by Belgium,” says Ann Carine Vandaele, principal investigator of the NOMAD instrument onboard ExoMars 2016 and scientist at the Royal Belgian Institute for Space Aeronomy. Complete article "NOMADs first view of the Martian atmosphere"
On 24 October 2016, 07:08 UTC, the GOME-2 /MetOp-A instrument implemented in the SACS system detected a very unusual plume of SO2 over Iraq, Syria and Turkey, and automatically notified the subscribed users, about 2 hours after the measurement was performed. This notification was confirmed few hours later by the OMI instrument which observed enhanced local SO2 emission in the area (see left Figure 1). This exceptional detection of SO2 is due to the burning of the sulphur mine of Al-Mishraq by fighting forces. This voluntary act led to the massive release of sulphur species in the atmosphere which could be detected from space. The main objectives of this mission are to search for atmospheric trace gases and to test key technologies in preparation for ESA’s contribution to subsequent missions to Mars. 16 september 2016 - In 1994, the UN General Assembly proclaimed 16 September the International Day for the Preservation of the Ozone Layer, commemorating the date of the signing, in 1987, of the Montreal Protocol on Substances that Deplete the Ozone Laye. Global stratospheric ozone amounts stopped decreasing in the late-1990s, and have stabilized at levels about 2-3 % less than those observed in 1980. The latest international assessment of stratospheric ozone (WMO, 2014) has reported a small but statistically significant increase of ozone around 40 km, which has been attributed to both a decrease of ODSs and the cooling of the stratosphere by increased abundance of greenhouse gases. More recently, several studies have shown signs that total ozone may be starting to recover over Antarctica. Due to the long lifetimes of ODSs in the atmosphere, full stratospheric ozone recovery will take several decades. Stratospheric ozone recovery will also be impacted by climate change. September 15, 2016 - The large-scale burning of crop residues in the North China Plain (NCP), one of the most densely populated world regions, was recently recognized to cause severe air pollution and harmful health effects. A reliable quantification of the magnitude of these fires is needed to assess regional air quality. The Royal Belgian Institute for Space Aeronomy (BIRA-IASB) and its partners ULB, KNMI (Netherlands) and the Peking University (China) used an eight-year record (2005–2012) of formaldehyde measurements from space to constrain the emissions of volatile organic compounds (VOCs) in this region. Using inverse modelling, the scientists derived that satellite-based post-harvest burning fluxes are, on average, at least a factor of 2 higher than state-of-the-art bottom-up statistical estimates, although with significant interannual variability. Crop burning is calculated to cause important increases in surface ozone (+7%) and fine aerosol concentrations (+18%) in the North China Plain in June. The impact of crop fires is also found in satellite observations of other species, glyoxal, nitrogen dioxide and methanol, and researchers show that those measurements validate the magnitude of the top-down fluxes. The study indicates that the top-down crop burning fluxes of VOCs in June exceed by almost a factor of 2 the combined emissions from other anthropogenic activities in this region, underscoring the need for targeted actions towards changes in agricultural management practices. Nature Scientific Reports - Substantial underestimation of post-harvest burning emissions in the North China Plain revealed by multi-species space observations. Radio Meteor Zoo: help us detect the Perseids! August 8, 2016 – The Royal Belgian Institute for Space Aeronomy (BISA) invites everyone to help scientists monitor the Perseid meteor shower by way of the “Radio Meteor Zoo”. The website www.radiometeorzoo.be provides all the necessary information about meteors and their detection by the Belgian BRAMS network. Everyone who is interested can participate in the observation and count of the Perseids, a meteor shower originating from the comet Swift-Tuttle, starting from August 12, 2016. Press Release " Radio Meteor Zoo": help us detect the Perseids! As each year, the Royal Palace in Brussels opens its doors to the public in summer: from 22 July to 4 September 2016. The public is able to discover the exposition Cartographiae showing maps and cartography throughout the centuries. In relation to the space research domain the exhibition also has polluting gases mapped by the OMI satellite instrument on display. 15 June 2016 - The AROMAPEX campaign was carried out in April 2016 in Berlin. The scientific team involved in the project includes researchers from Germany (FUB, University of Bremen, DLR, MPIC), Belgium (BIRA, VITO), Netherlands (KNMI, TNO, TU Delft) and Romania (INCAS, UGAL). The primary objective of the AROMAPEX experiment was the inter-comparison of APEX and AirMap; two airborne imagers dedicated to tropospheric NO2, a major air pollutant in urban areas and a key species in tropospheric chemistry. The airborne imagers were operated from two planes: APEX was on board DLR's Do-228-112 D-CFFU and AirMAP on board the FUB Cessna C-207D-EAFU. 18 May 2016 - AURORA (Advanced Ultraviolet Radiation and Ozone Retrieval for Applications) is a space research project funded by the European Community‘s H2020 programme in the field of Earth Observation. The project was launched on 1 February 2016, with a 36-month duration. AURORA’s overall objective is to use the different tools of the Sentinel-4 and Sentinel-5 missions of the Copernicus programme to monitor the profile of ozone in the atmosphere with unprecedented accuracy. BIRA-IASB is responsible for the definition of the ozone and UV validation requirements and approaches. BIRA-IASB will develop methods and simulations for the retrieval of tropospheric ozone using the visible spectral channels. BIRA-IASB also leads and performs the performance assesment and data validation of ozone retrieval/fusion/assimilation procedures and resulting data products. 29 January 2016 - To prepare the future ExoMars mission, a consortium of seven European scientific institutions, coordinated by the Instituto de Astrofísica de Andalucía (IAA-CSIC), will develop new analytical techniques to exploit data of existing missions to Mars. With its internationally recognised expertise in the observation and modelling of planetary atmospheres- the Royal Belgian Institute for Space Aeronomy (BIRA-IASB) will undoubtedly be a very valuable project partner. 16 January 2016 - In order to get a better idea of the state of the plasmasphere, one of the inner regions of the magnetosphere, our colleague Fabien Darrouzet installed a compact VLF antenna at the Princess Elisabeth base in Antarctica (from January 8 – February 10, 2016). The antenna is part of a worldwide network that gathers data to improve and refine computer models of the plasmasphere. 28 October 2015 - The renowned scientific journal Nature will publish a perplexing discovery on Thursday October 29th: the European Space Agency’s Rosetta spacecraft has discovered – for the first time ever – the presence of oxygen gas O2 in the atmosphere of comet 67P/Churyumov-Gerasimenko. Moreover, oxygen turns out to be a major component, constituting up to 10% of the comet atmosphere. Argon discovered in the atmosphere of a comet, thanks to a Belgian instrument. 29 September 2015 - An article published only recently in the scientific journal Science disclosed Rosetta’s discovery of traces of argon in the atmosphere of the comet 67P/Churyumov-Gerasimenko. We owe this discovery to the DFMS mass spectrometer of the ROSINA instrument. This instrument, which is carried on board the Rosetta probe, was finalised in collaboration with the scientists and engineers of the Royal Belgian Institute for Space Aeronomy (BIRA-IASB). The high resolution of this instrument enables it to detect two variants of argon (isotopes 36Ar and 38Ar). 1 September 2015 - In the early morning of 2 September, ESA’s Danish astronaut Andreas Mogensen will fly on a Soyuz spacecraft for a short-duration mission of 8 days on board the International Space Station (ISS). Once on board, he’ll get to work inside ESA’s Columbus laboratory, carrying out a series of European experiments to test new technologies and operational techniques for future space missions. Belgium is giving operational support for two of them. 11 August 2015 - The Perseids - watching and listening to falling stars Like every year, Earth will pass mid August through the trajectory of the dust cloud left behind comet Swift-Tuttle very likely giving us a night sky filled with bright falling stars. The moon will be in a cooperative mood and won't shed its light, thus promising a dark night. Meteors can also be heard on radio, when transmitted radio signals bounce back on them. At the Royal Observatory of Belgium, between the prestigious domes, amateur-telescopes will be installed on August 12 to enjoy a beautiful star sky. The radio receiver from the Belgian RAdio Meteor Stations netwerk (BRAMS) located on the domain will catch the radio signals that mark the presence of the meteors. July 9th 2015 – To prepare the future ExoMars mission, a consortium of seven European scientific institutions, coordinated by the Instituto de Astrofísica de Andalucía (IAA-CSIC), will develop new analytical techniques to exploit data of existing missions to Mars. With its internationally recognised expertise in the observation and modelling of planetary atmospheres- BIRA-IASB will undoubtedly be a very valuable project partner. The European Commission has described the science to be deployed in this project as ‘excellent’ and has granted funding of over €2 million under the Horizon 2020 programme. 10 June 2015 - In August 2014, a call for the fourth medium-size (M4) mission opportunity was issued in the frame of ESA's Cosmic Vision Programme with launch foreseen in 2025. ESA received 27 proposals in response to this call, amongst which also THOR (Turbulence Heating ObserveR) in which the Space Physics division at BIRA-IASB is involved. After a thorough evaluation of the scientific and programmatic aspects of all candidate missions, THOR was recommended as one of the three mission concepts to proceed to a Phase 0 study, which is the first official phase of a mission. In mid 2017, ESA will finally decide which of the three will go ahead. 12 May 2015 - To measure the ozone distribution in the stratosphere, the temperature in the mesosphere and the electron density in the ionosphere, the Royal Belgian Institute for Space Aeronomy (BIRA-IASB) is developping the PICASSO satellite, in collaboration with VTT (Finland), Clyde-Space Ltd (UK) and the Centre Spatial de Liège (Belgium), for the European Space Agency ESA. On 23-24 April 2015, the PICASSO mission was reviewed by ESA during a Preliminary Design Review (PDR) collocation at the European Space Research and Technology Centre (ESTEC). Both instruments (VISION and SLP) and the platform were positively assessed during a very intense questions/answers session with ESA experts from different fields. March 20, 2015 - ESA’s comet probe Rosetta has for the first time ever measured nitrogen gas at a comet, providing clues to the early stages of the formation of our solar system. The measurement was made possible thanks to the high mass resolution of the ROSINA/DFMS mass spectrometer, for which the Royal Belgian Institute for Space Aeronomy together with imec and OIP built most of the detector assembly. The study was led by researchers at the University of Bern and has now been published in the journal «Science». Les objets gelés dans le système solaire attirent beaucoup d'attention : comme des fossiles, ils conservent des renseignements sur l'origine du système solaire. 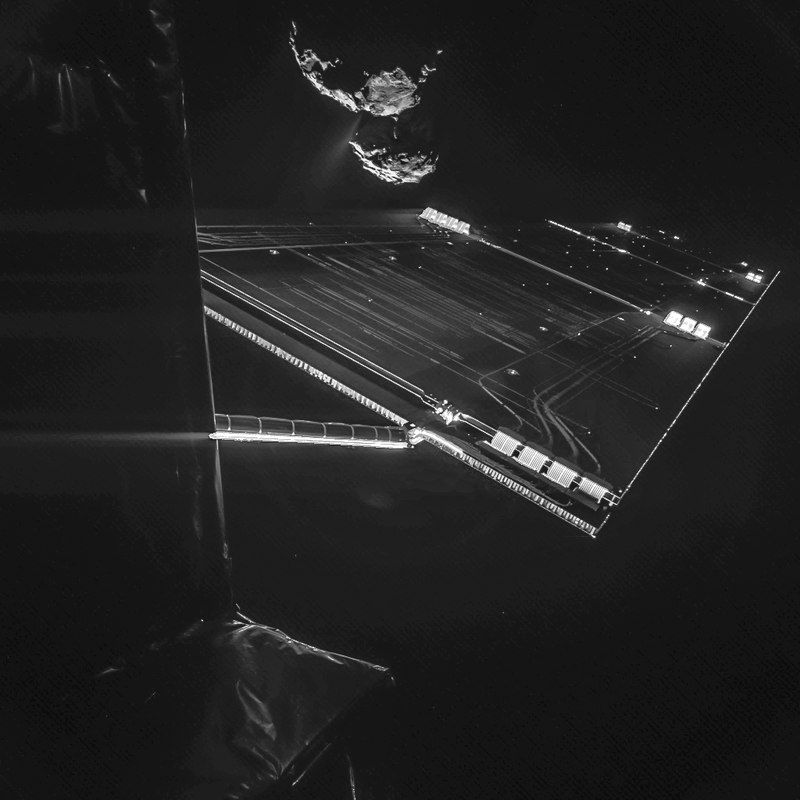 23 January 2015 - In August 2014, the European Space Agency’s Rosetta spacecraft arrived at comet 67P/Churyumov-Gerasimenko. Once in orbit, it swooped as low as 10 kilometers to get unprecedented data from the comet (and to drop off its short-lived Philae lander). Today, Science Magazine is publishing a suite of new papers detailing some of the mission’s first findings. BIRA-IASB scientists are involved with their analyses of data coming from the ROSINA instrument that measured the coma composition of comet 67P. Other new findings suggest a wide range of deuterium-to-hydrogen (D/H) ratios in the water within Jupiter family objects (based on measurements around the Jupiter family comet 67P) and preclude the idea that this reservoir is solely composed of Earth ocean–like water.